We accept Visa, MasterCard, or Debit Card. If you prefer to place your order over the phone, please call us at 1-979-472-0336. Standard business hours are Monday thru Friday 8:00 am - 5:00 pm Mountain Time. Pay by check or Term Accounts require prior approval. Authorized accounts will have the option of "'Bill Me" at check out. Please contact Polar Bear Tees to request a Credit Application & Credit Agreement Form. This form can also be found under the My Account/Forms section for registered users. Polar Bear Tees collects Texas Sales Tax of 8.25% for customers whose shipping address is within Texas. This however is subject to change with changing legislation governing online sales. Please contact Polar Bear Tees to request a Texas Resale Certificate Form and/or Sales Tax Exemption Form. These forms can also be found under the My Account/Forms section for registered users. Screen printing is the process of using plastisol ink printed in thin layers onto garments and cured at 320 degrees Fahrenheit. Is screen printing permanent? Does it wash out? Screen printing is permanent. Your design will not wash out in regular household washing machines. Plastisol ink will react with dry cleaning fluid. Do not dry clean screen printed garments. Can I screen print on the pocket? Sleeve? Leg? Yes, we screen print on pockets, sleeves, and legs. There is a limitation on design size and subject to the individual manufacturer's size of pocket, sleeve, or leg area. There is $0.55 charge per print for pockets, sleeves, and legs or other specfic areas that require additional handling time during printing. We do not screen print across seams (example, short bottoms or side seams) or zippers. Printing on both sides of a zipper jacket are considered two separate artwork designs. Maximum design area is 12.5 ” x 17.5” for all unisex adult size t-shirts and youth size XL through medium. Ladies, juniors, tanks, youth small and other garment print areas differ and are smaller. At the time of garment sizes and artwork submission the max print size will be determined and adjusted. You will be sent a final proof of artwork with exact print dimensions for approval. What is an "Under Base"? Under base is used on all dark garments as a primer with white ink to block out the garments dark color before applying another ink color. An under base requires additional printing time. Printing dark shirts costs more than printing on light color shirts. Can I match my ink color exactly? Yes, we offer Pantone Color ink matching. There is an additional cost for Pantone Color matching. You will need to request a quote for artwork requiring ink matching. Do you offer screen printed name and number? Is there a minimum? Yes. Screen printed names are $6.00 per name. Please call for minimum. We do not screen print team numbers. Team numbers are heat applique with vinyl Thermo-Film. Please call for pricing, sizes and quantity minimum. What is the difference between 6.1 oz and 5.4 oz 100% Cotton t-shirts? Fabric is measured by the thread density per square inch. 6.1 oz. 100% cotton is the heaviest shirt we offer. They are our best selling t-shirts. We strongly recommend the 6.1 oz 100% cotton for white t-shirts. What is Ultra Soft Cotton? Ultra Soft Cotton is ring spun cotton in a lighter weight fabric. Most Ultra Soft Cotton shirts are 4.3 oz weight. Ring spun is a technique of spinning cotton that produces a much softer texture and feel wash after wash. They are more expensive shirts and hoodies. Expect to pay more for ring spun cotton. They are well worth the money! We especially recommend the American Apparel brand shirts. Tri-Blend is Polyester / Cotton / Rayon. They are equally considered one of the softest shirt fabrics. Polyester retains shape and elasticity, cotton lends both comfort and durability, addition of rayon makes for a unique texture and drapes against the body for a slimming look. Expect to pay more for Tri-Blend garments. They are well worth the money! We especially recommend the American Apparel brand shirts. Does the 50/50 Poly/Cotton blend shrink or fit smaller? Yes. In our opinion, the lesser expensive t-shirts tend to fit smaller. The poly/cotton blend garments tend to shrink from heat in a regular washer/dryer. If in doubt, we recommend ordering the next size up. It is our opinion that the 50/50 do not absorb sweat as well as the 100% cotton. It is our opinion that the 50/50 are tighter around the neck line after regular washing and drying. Does the 5.4 oz 100% Cotton and 50/50 Poly/Cotton blend t-shirt fit smaller? Yes. In our opinion the lesser expensive t-shirts tend to fit smaller and the youth are shorter. If in doubt, we recommend ordering the next size up. Yes. They are limited in color choices. Not all brands offer Big and Tall. You can search on Big and Tall sizes. Tall sizes average 2 1/2" longer. What are the size specifications of t-shirts? Specifications differ by brand of shirt and by style. In the Products sections there are Specification Charts you can click on to view specifications by brand, by style, and by size. Step 1: Choose your garment style and garment color. Step 2: Choose your sizes and quantities. Step 3: Select a pre-designed template design from our gallery of designs and add your custom text. Next, you will receive an Artwork Proof within 24 hours to approve before printing. After final artwork approval, you will recieve your shirts within 10 business days, unless otherwise agreed for a rush order. Upload your own custom artwork and order information. Call Customer Support to discuss your custom job. Custom jobs are given a custom invoice to pay online and complete your order. Can I add more shirts to my order once it has been placed? Yes. You can add shirts to your order within the first 24 hours of placing the order. The sooner you let us know of additional sizes, the better. We recommend contacting Customer Support at (979) 472-0336. You cannot change rush orders. Can I change the sizes in my order once it has been placed? Yes. You can add shirts to your order within the first 24 hours of placing the order. You may accrue a restocking fee plus any additional cost resulting from the change to your original order. We do not recommend making changes to your order once it has been placed unless it is absolutely necessary. Yes. There is a minimum order of 24 pieces. There are possible exceptions for reorders of less than 24 pieces. Contact Customer Support for below minimum reorders at (979) 472-0336. What if I don't like the artwork design? All artwork goes through a thorough approval process to make sure the customer is satisfied with the final design. Once artwork is approved, Polar Bear Tees is no longer responsible for any last minute revisions. Final artwork approval should not be made until completely satisfied. If in doubt, call Customer Support at (979) 472-0336. To order printed samples, you must contact Customer Support directly. There will be a $50 charge plus a deposit for the full retail cost of the garment, freight incurred, and art time must be paid in full. There is no refund for printed samples. Yes. All customer orders, purchase orders, and artwork proofs are maintained in your My Account and available online. There will be a $35 reorder fee assessed to all reorders under 24 pieces. Reorders will be priced at their current quantity ordered. Reorders will not be spent an Artwork Proof. All reorders are "exact" reorders only. Any changes will constitute a new design. Standard production time is 7 working days upon receipt of artwork approval, complete order, and payment. Orders recieved after noon (12pm MT) are logged onto the production schedule the following business day. Allow 1 - 4 days for UPS Ground delivery depending on shipping zip code. All orders ship from Texas. View UPS Ground Map to estimate shipping days based on shipping location. Orders cannot go into production without final artwork approval. Please keep this in mind if there are defined due dates for your order, as rush charges may be incurred if artwork approval is delayed. Can I get my order sooner? What are the Rush Order fees? Jobs that require production in less than 7 business days are considered a Rush Order. 3 Day Super Rush Charge - Call for pricing and availability. Super Rush is not available in high season or periods of heavy production. Polar Bear Tees ships UPS Ground. Expedited shipping will be the responsibility of the customer. You will need to call Customer Support at (979) 472-0336 to request shipping other than UPS Ground. 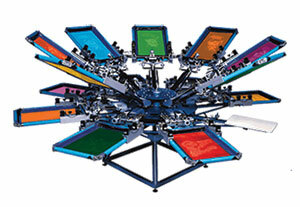 Screen printing price is determined by the number of colors in the design. The screen printing price is higher with the more colors of ink in a design. Screen printing is priced in volume. Price breaks are at 24, 36, 48, 72, 144, 288, 576, and 1200+. Reorders will be priced at their current quantity ordered. Polar Bear Tees price per shirt is inclusive of all fees. There are no hidden setup charges or screen charges. There is no art time for Polar Bear Tee's artwork designs. Customer "custom" artwork will be subject to art time. Instant Quote or you can get a quote directly on each products detail page. Just choose your shirt and shirt color, the number of ink colors front and back, and your size quantities. To recieve a Custom Quote on your own custom artwork, you will need to upload a file(s) of your artwork for our art department to evaluate. After we recieve your file(s), you can request a phone call, call us, or request a written quote by email. What is an Ink Color Change charge? An ink color change occurs when the same screen requires an ink cleaning during production. A $15.00 color change per screen will be charged. Half of an order is printed with red ink and half is printed with blue ink - that is one color change. All items are shipped UPS Ground, unless otherwise requested. Wrong addresses or unspecified "residential" addresses are subject to a $20 charge for each UPS change of address. Do you provide folding or bagging of items? No. All items shall be "bulk" packaged in bundles of a dozen per size, color, style, and design. Yes, we offer 3 and 5 day Rush Orders. Jobs that require production in less than 7 business days are considered a Rush Order. Orders will ship regular UPS Ground. Allow 1 - 5 days for UPS Ground delivery depending on your shipping zip code. Polarbear Tees ships UPS Ground at no charge. Expedited shipping will be the responsibility of the customer. You will need to call Customer Support at (979) 472-0336 to request shipping other than UPS Ground. Polar Bear Tees accepts returns and will refund payment for one of the following reasons: (a) the blank items themselves are materially flawed; (b) the quality of the decorating (i.e. the printing or embroidery) is below a reasonable range of expectations; or (c) the design of the final product is materially different from the final design approved/submitted by the customer. How can I return an order? What is a Return Merchandise Authorization (RMA)? You must contact Customer Support within 7 days of receipt of goods either by written email or phone. You must receive an authorization number to return orders. You will be issued a UPS return shipping label for approved returns. How fast will my replacement order be shipped? Replacement orders go to the front of the production line and are a priority for art approval, printing, and shipment.